The Avenue of the Giants enters Humboldt Redwoods State Park from the south just beyond the little village of Miranda and soon after passes Bolling Grove, the first major named group of redwoods and the earliest to be saved from logging (it was purchased in 1921), which has several short footpaths. 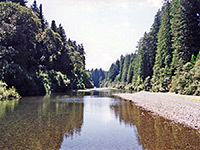 The avenue then crosses to the west side of US 101 at Myers Flat, a settlement built at the edge of a large treeless meadow surrounded on three sides by a wide meander of the South Fork of the Eel River. Two longer trails start shortly after, at the Williams Grove day use area; a path crosses the usually placid, slow-moving river on a dainty footbridge (removed during high water periods in winter) then forks. 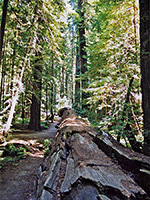 One branch, the Childrens' Forest Trail, follows above the river southeast, crossing several small creeks and ending with a loop through a mixed fir and redwood grove while the other tracks the river northwards, initially to the Garden Club of America Grove, then onwards to other, more remote areas in the backcountry. 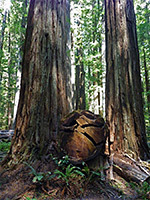 The redwoods in this region are impressive enough but are mixed with different tree species and are not as large as others elsewhere in the forest. Map of Humboldt Redwoods State Park. 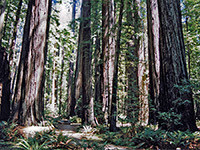 For the next few miles, the avenue passes more named groves and the Humboldt Redwoods visitor center, then reaches the turning for Founders Grove, the most popular location in the state park - this has several easy trails amongst many large, healthy redwoods that grow in quite an open environment in which the trees are interspersed with wildflowers, ferns and grassy areas, and plenty of sunlight penetrates the upper canopy. One tree in the grove vied with others to be the tallest in the world; it stood at around 365 feet and survived for an estimated 1,500 years before toppling in March 1991 after being hit by another falling tree. This is the Dyerville Giant, which now begins the slow process of decomposition - the huge 17 foot thick trunk is likely to remain intact for several hundred years more. The road past the grove (the Dyerville Loop Road) soon exits the park, becomes unpaved and follows the main branch of the Eel River for a while then climbs into the hilly, forested mountains to the southeast, reaching a height of 3,400 feet then finally rejoins US 101 many miles to the south - a very scenic drive. 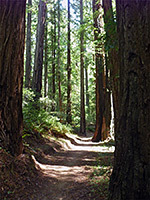 Just beyond Founders Grove, another side road leaves the Avenue of the Giants and follows Bull Creek along a particularly densely-wooded valley into the Rockefeller Forest, the largest remaining old-growth redwood forest on Earth. The longest lived tree so far measured in this location was over 2,200 years old. 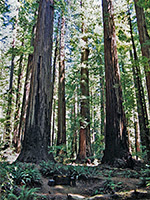 Even in this region of large trees, the redwoods here stand out as something special - the well-watered ground and sheltered valley produce unusually luxuriant and impressive growth, and very atmospheric conditions. The center is a grove with the largest trees, including Tall Tree (359 feet), Giant Tree (363 feet) and Flatiron Tree (a massive fallen tree with an unusual shape). The surroundings are rather different to other locations - here the woods are darker and much more densely filled, by both living trees that grow very close together and by many ancient fallen logs and stumps in various stages of decomposition. All are covered with thick moss, vines and creepers, bushes and reeds, and away from the popular trails the forest is perfectly silent and peaceful, and more than a little creepy. The best path hereabouts is the 2.4 mile loop along the Homestead and Big Tree Trails. The scenic drive through the Rockefeller Forest (Mattole Road) is narrower than the avenue and winds sharply between the trees - in places it seems to end abruptly as the way ahead is hidden until the last minute. It progresses through the forest then climbs up from the creek, through a pass at 2,700 feet after which the redwoods fade away and are replaced by fields and lesser woodland. After a two hour journey from US 101 and the Humboldt Redwoods State Park entrance, the road reaches the Pacific Ocean, one of only three routes to a 100 mile section of the shoreline known as the Lost Coast. This is largely inaccessible due to very steep mountains and ravines so as a consequence has remained the most pristine and undeveloped part of the entire western US shore.